Of this past weekend's new releases on Netflix, I recommend Russian Doll most of all. It's a phenomenal show consisting of eight brisk episodes, each less than 30 minutes or so, and each becomes more inviting in sequence. Although it smashed my Friday night plans, I binged it, both because I wanted to know what happens and because Natasha Lyonne is the 8th wonder of the world. Really, I was kinda flattened by it emotionally, which left me deeply impressed, since the premise makes it sound, superficially, like just another variation on Groundhog Day. In itself that's not necessarily a bad thing, but in the hands of creators Lyonne, Leslye Headland, and Amy Poehler, it's a thing of beauty, because it foresees the paths that it's expected to travel, and responds with a curt, 'no thank you,' and 'nope, won't take the opposite trail, either. I have my own destination in mind.' And so it heads off somewhere I did not expect and could not anticipate. It's not about finding your own place in the world, it's about making your own place in the world, but just for now. We all need somewhere to alight for a while, and the people behind Russian Doll know that and make it happen. The show is funny and smart, and it touched me where most shows dare not tread. 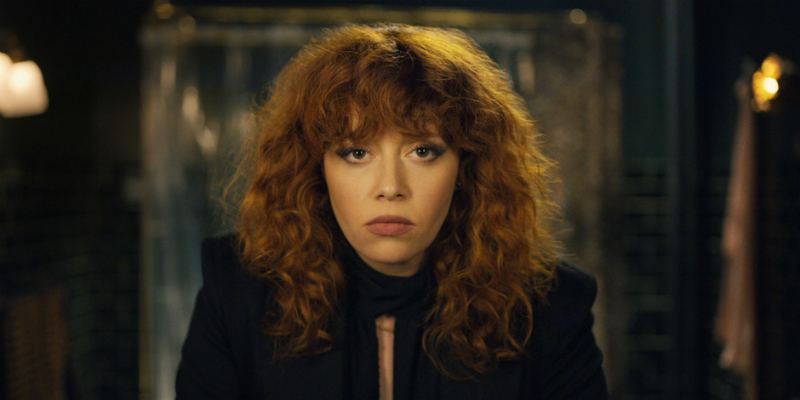 My conclusion is that I now love Natasha Lyonne's portrayal of Nadia Vulvokov, the software engineer she embodies, but not in a creepy, stalker, menacing fashion, but in the sense that I would her like her to remain somewhere in my mind so I could see her again some time before I die and see how everything turns out for her. Russian Doll is available to stream on Netflix. Down, the latest installment in Blumhouse Productions' Into the Dark series on Hulu, starts with a good, long, tantalizing setup, as two characters get to know each other, trapped in an elevator after everyone else in the office building has gone home for the night. It's set the night before Valentine's Day, which allows it to fit into the holiday concept of the series. But. Yeesh. 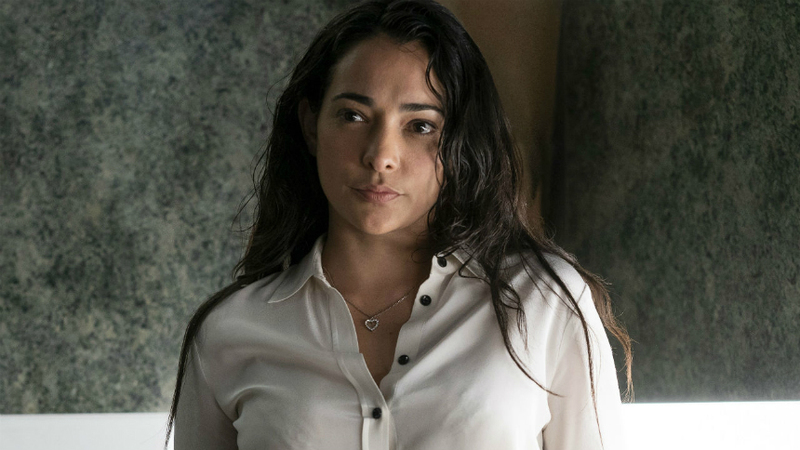 Natalie Martinez portrays an accomplished woman who becomes torn between a disappointing long-distance boyfriend and the hawt if discomfiting stranger in her personal space. She makes her character sympathetic and understandable. Until a certain point, that is, when she does something bewildering that, frankly, took me out of the realm of reality and firmly into the toxic wonderland of male fantasy. The script introduces a twist that is intended to be startling -- it's not, really -- and then proceeds to undo all the good that it accomplished, replacing it with increasing waves of unhinged behavior. Director Daniel Stamm gained notice with his debut, A Necessary Death (2008), about which our own Collin Armstrong noted: "Too twisty for its own good, the piece collapses under the weight of outsized machinations which break too far from believability." That summed up my opinion as well, nearly 11 years ago, and I had a similar reaction to Stamm's 13 Sins (2014). Still, he knows what he's doing as a director and his films 'work' as far as provoking strong reactions. His craft as a director in Down remains apparent, making the most of the material, so I suppose it's the material itself that I find less appetizing, especially as I age rapidly into late middle age. Kent Kubena is a veteran producer; Down is his first credited script, and I wish it had strayed from certain conventions to a greater degree. Help yourself. Down is available to stream on Hulu. As much as I enjoyed watching Mads Mikkelsen in Joe Penna's survival drama Arctic (reviewed here and now playing in select theateres), I disliked watching him in Jonas Åkerlund's Polar (now streaming on Netflix). Kaiser Black, the assassin at the heart of the film, originated in a graphic novel written and illustrated by Victor Santos. (See more about it here.) As portrayed by Mikkelsen, he is a burned-out, hollow shell of a man who welcomes retirement at the age of 50, which is mandated by his employer, Blut (Matt Lucas). After trotting around the globe for 30 years or so killing people, he is ready to settle into a quiet existence, living in an elaborate cabin in the wintry climes of the far north, comfortable with the knowledge that he can finally collect on his 8-million-dollar retirement account. Little does he know that Blut has no intention of allowing that to happen, planning to kill Kaiser -- or have him killed -- before he can collect. Blut sends out a team of assassins, who dress as loudly as they snarl at each other and their victims. Naturally, Kaiser doesn't like this, but he has made the fatal mistake of developing a touch of kindness toward new neighbor Camille (Vanessa Hudgens), who doesn't like loud sounds and much, much blood will be spilled. Swedish director Jonas Åkerlund previously helmed the feature films Spun, Horsemen and Lords of Chaos, as well as a wealth of music videos and concert docs. Here he favors an all-out attack kind of approach, splattering visual effects, and a frenzied editing style into a film that repelled me more than anything; it's an aggressively nasty treatment of aggressively nasty characters. 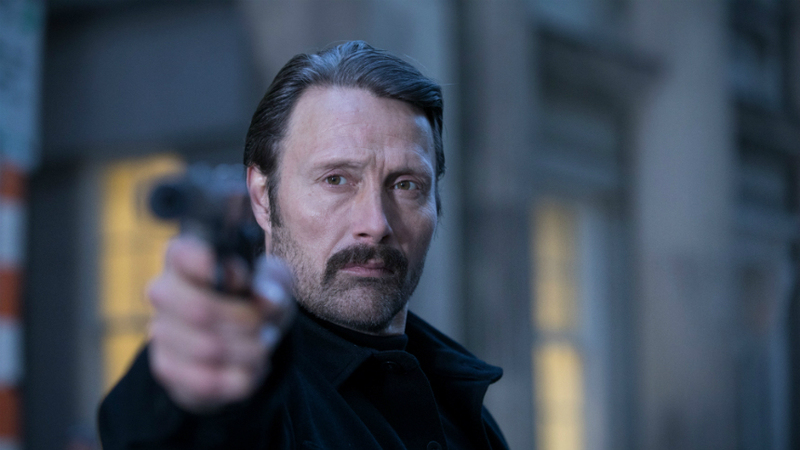 Still, I kept watching because of Mikkelsen's presence, which was the sole redeeming element for me. Help yourself. Polar is available to stream on Netflix.